Here’s some evidence that the media in the US and some other countries is not doing a very good job of explaining the implications of climate change, and how the threat of climate change should be seen relative to other threats. 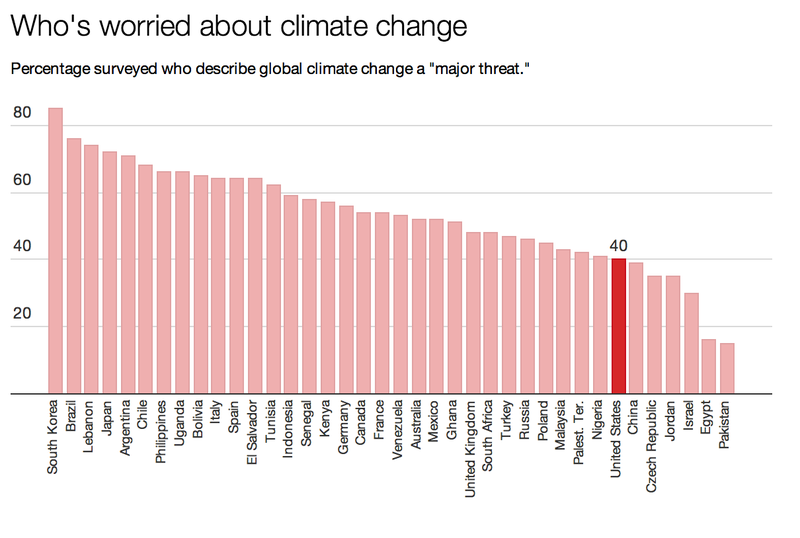 My guess is that far more than 40% of Americans would label “terrorism” a “major threat.” But the sort of terrorism most Americans worry about (bombs on planes, for example) is nothing compared to how climate change will impact humanity and the planet. There are two existential threats right now. Nuclear terrorism. And climate change. But apparently that’s not the message that the public is getting (click image for full size). And, of course, in the US climate change belief breaks down along political lines. The problem is, those with expertise have no power, and those with power have no expertise.